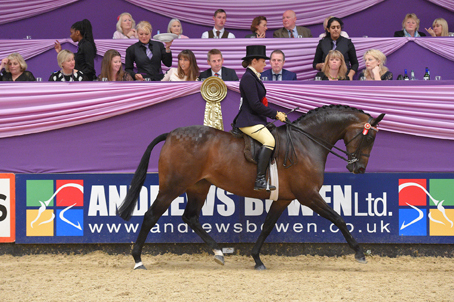 A winner of three titles at the 2016 Horse of the Year Show, Yorkshire-based Michaela Wood has seven horses on the show circuit, including Mountain & Moorlands, Coloureds, Hacks and Riding Horses. Here the TopSpec-sponsored show rider gives us some top training tips. 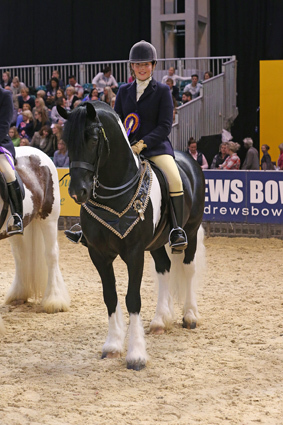 This year’s HOYS was one to remember for Michaela Wood when DP UK Nightdancer was crowned winner of the Small Hack of the Year and the 153cm Intermediate Show Riding Type while Login Lucky Lad, also owned by her father Martin Wood, headed the Coloured Ridden Native / Cob / Traditional Pony of the Year. Here Michaela provides a few tips as we head into the winter show and training season. • Try and work horses off the centre line and in squares rather than circles, this helps stop anticipation in the transitions and also ensures they don’t rely on the outside wall. • Vary your training, I like to do some hill work which helps keeps them focused, fit and stops them getting bored too. • Have someone video you….I always find something that I can improve on, and it’s a good thing to do on a regular basis so you can go back and see how you have improved. • Practice canter work on the straight, this will help enormously as in a set show it is asked for increasingly. • As a rider keeping yourself fit and healthy is also important, Pilates helps with tension issues in the shoulders and makes you use your core more, which also helps make the horses lighter in the hand. • Ring craft is something to be worked on at home, keeping your horse in a controlled rhythm practising half halts will help with any rushing issues. This comes into play a lot in the show ring when their maybe riders overtaking you. • And when you do get in the ring remember to slow down, breathe and make your horse look elegant for the judge. • As well as having your show horse well-trained they must also look the picture of health. All my horses and ponies are feed on a TopSpec feed regime and we want to have them looking well covered and in good condition but not fat or over-topped.